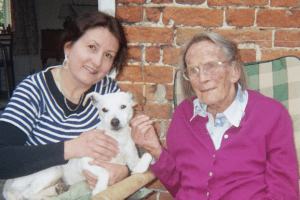 Caring for an elderly parent, spouse or other relative can be challenging in so many ways – it can place emotional, physical and financial strains on the family carer. It can even have a negative effect on the health of the family caregiver because all of the demands placed on them can lead to overwhelming stress and exhaustion. The impact of such stress is a risk to your own well-being and health, and can affect your ability to provide proper care for your loved one. It is, therefore, important to use coping strategies and to seek support wherever possible to help you with the responsibility of being a caregiver. 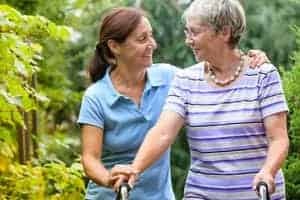 Of course, it is entirely understandable that, even given the challenges of caring for an elderly loved one, it is something that many people are very willing to do. But few people realise, when they first take on the role, exactly what it entails and what it will take out of them personally. Some people, on the other hand, may not have taken on the role willingly but were thrust into the role of carer out of necessity with little or no preparation or previous experience. Many family members also feel a huge sense of responsibility and guilt. Let’s first have a look at some of the reasons why family members provide elderly care for their loved ones before considering some of the emotions you might experience as a family caregiver, some coping strategies that will help you and where to find support if you need it. According to research, in the UK nearly 97% of people want to stay in their own home when they become older and less able to look after themselves, even if it’s a struggle to cope. Moving into a residential care home is certainly not most people’s first choice of elderly care. 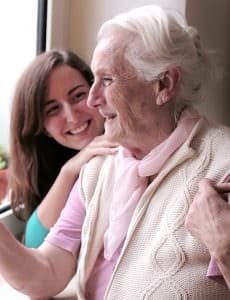 So, naturally, if you are able and willing to assist your loved one and provide that care at home then that is by far the preferred option to help them remain in their own home. Caring for an elderly relative in their own home is an admirable responsibility to take on and can be very rewarding; but there’s no denying that there are significant challenges too, especially if that care is provided full-time and if you, yourself, are not as young as you used to be. While being a family carer you may also have to juggle other responsibilities and this can add to the stress so whilst your priority will be the person needing care, you mustn’t neglect your own needs and well-being. Today many people are coping with caring for a loved one that now presents with a care need as well as raising their own family. The impact both sets of responsibility brings is not to be underestimated. One way to make things easier for both the carer and the person being cared for is to adapt the home so that it is safer and more suitable for senior living. Special equipment is available such as stair lifts, hoists, bathing equipment, ramps and hand rails; and, of course, more major home alterations such as converting a downstairs room to a bedroom and an accessible shower room may also be needed depending on the particular circumstances. If you have lived in your home for a long time you may feel that major alterations are not only expensive and disruptive but will make your home not feel like home anymore. 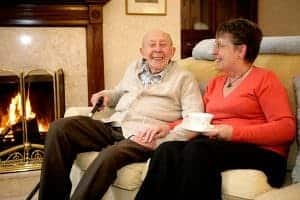 But remember that most alterations will make it easier to care for your loved one and may even offer them some small measure of independence (for instance a stair lift) so such changes will overall ease the pressure on you as the carer too. Some alterations and special equipment can be expensive but there are also simple, inexpensive solutions (such as handrails in the bathroom). So check with your local authority about whether you are eligible for financial help with any equipment or home alterations. Ask your GP for a referral to an Occupational Therapist who can perform an assessment to find out what alterations or equipment would be helpful and whether it would be funded by your local authority. Even if you have to pay for equipment yourself an Occupational Therapist can advise you on what will work best. At the very least the assessment is something you will be entitled to. When someone needs care and assistance with everyday tasks such as washing, dressing or eating, and you are willing to provide that help, it should be a simple matter to just get on with it. Unfortunately, some people are reluctant to accept someone else caring for them – even a loved-one (sometimes especially a loved one). It can be very hard for some people to accept the loss of their independence. Be sensitive to the needs of the person you care for in this respect, especially where you are taking over roles that used to be theirs, such as doing most of the driving, or the shopping, cooking or gardening. They may not only have to come to terms with a new illness but also the loss of what may have been a life-long role they enjoyed that contributed to their self-esteem. Try to maintain a healthy balance and share roles and responsibilities where you can – this can also take the pressure off you. For instance if your loved one has mobility problems they may still be able to deal with the post and bills etc. or even prepare food that doesn’t need cooking (just watch out if they want to get involved in cooking as this might be dangerous for those with mobility problems or those living with dementia). It is important not to treat your relative as being totally incapable both for their self-esteem and to prevent you, as the carer, being overwhelmed with the responsibility and sheer hard work of doing everything. When you are providing elderly care for a relative you might experience a whole variety of emotions. Some emotions may appear right from the start but some can develop over a prolonged period. It’s important to recognise that all emotions you feel are normal and to avoid feeling guilty about certain feelings you may have. In such a difficult situation all feelings are entirely valid. Don’t try to deny what you are feeling; good or bad, instead find an outlet for the emotions or find support to help you – there is no need to suffer in silence. Anger Feeling angry is particularly common when we feel the person we loved is no longer that same person. Anxiety Anxiety can easily build up – especially if you are worried about the future. It can appear as any number of physical symptoms. Boredom As a family carer your own needs and wants will naturally take a back seat and you may find yourself simply bored by the situation you find yourself in. Depression Caring for an ill or frail loved one is an intensely emotional situation that can deeply impact a family caregiver so low mood or even depression is common. Embarrassment You might feel embarrassed having to wash a grown adult and take them to the toilet. Or you might feel embarrassed around other people if your relative has a condition that affects their behaviour. Fear You may feel afraid about what might happen in the future; your loved one deteriorating or passing away and you being left alone. These are just a few of the emotions you might feel when you are providing elderly care for a spouse, parent, or other close relative. But remember there are many support groups out there and many people in the same situation. Your GP or social services can help find a local group that can offer the support you need. You will also find cafes that bring together people in situations like this. Frequently contracting colds or other minor health problems. Learn How to Say No Do you find yourself always agreeing to requests to do something - whether it's for the person you care for or someone else in your life? If you do then, for the sake of your own physical and mental well-being, you need to learn how to say "no" to requests that are not essential. This doesn't mean you cannot still, for instance, provide hospitality in your home but instead of offering to cook lunch for friends or family instead invite them for coffee and biscuits or arrange a "bring & share" meal so that others do the cooking. And if you are doing everything for the person you care for when they are still capable of certain tasks then you need to make sure the load is shared and they do what they can. This will not only help you but also raise the self-esteem of your loved one. Accept You Are Not Perfect Learn to accept your imperfections – you may not do things in the same way someone else might – you may not be able to do things in the way the person your care for used to do. That's OK – you may not be able to cook up a perfect Sunday roast but you have other skills and, more importantly, you have taken on the hugely valuable responsibility of caring for another human being. Value that and encourage others to do the same. After all nobody is perfect. Accept The Things You Cannot Change Identify those things that you cannot change – this may be the behaviour of the person you care for, maybe because they are living with dementia or have experienced a stroke. Or they may have mobility problems that limit what you can do together. You cannot change these things but you can try to change how you react to them or how they make you feel. Doing so will help you feel more in control of your situation and, therefore, less resentful of the limitations imposed by your new, changed way of life. Look To The Future, Not The Past Try not to dwell on how things used to be - instead focus on how things could be. You may not be able to go for long walks by the sea with your loved one anymore but maybe you could go out to lunch somewhere overlooking the sea or another beautiful view. You may not be able to have stimulating conversations with your loved one anymore but you could enjoy listening to your favourite music together or perhaps watching a favourite film. Value The Small Things Take the opportunity to enjoy the small pleasures in life: sitting in the garden on a sunny day, tending a herb garden, baking a cake for a friend or looking through old photo albums with your family. Set Realistic Goals Don't try to do everything – set realistic goals of what you can achieve each day, each week or each month by prioritising all the tasks that need to be done. Take help where it is available. For instance, many pharmacies will deliver regular medication to save you the time going to pick them up. Bills can be paid online or over the phone without the need to go to the bank – even better set up direct debits so you don't have to worry about paying bills on time. Establish a daily routine Make lists of what needs to be done every day – such as regular health appointments, medication, food shopping, other errands. Getting into a regular routine will prevent you from feeling overwhelmed and worrying that important tasks will be forgotten. Prioritize what needs to be done, make lists, and establish a daily routine. If "to-do" lists become too long then cull the list to only those essential tasks. Keep In Touch Keep in regular contact with family, friends and neighbours. It's all too easy when you are focusing on caring for a sick or frail relative to forget about those around you. You may not wish to ask them for their help but it's good to know they are there if you need them - so stay in touch. They may also be the people who can help you "let off steam" from time to time. Keep Fit & Healthy Prioritise regular exercise and try to be physically active and get some fresh air every day even if that is simply walking to the shops. If you can't get out of the house easily then be as mobile as possible around the house. Try and eat a healthy and well-balanced diet to keep your energy levels up but don't deny yourself the occasional treat. Remember To Laugh Try to keep a sense of humour about your life and your own personal situation. Humour is a great healer and it is proven that laughter reduces stress, can relieve some physical aches and pains and can even strengthen your immune system. So watch a comedy programme on TV or read a funny book. Seek A Local Support Group There are many support groups for family carers in local communities so join one near you so you can meet people in similar situations, who are going through the same challenges caring for a love one. Some can help with temporary care if you cannot leave your relative alone. 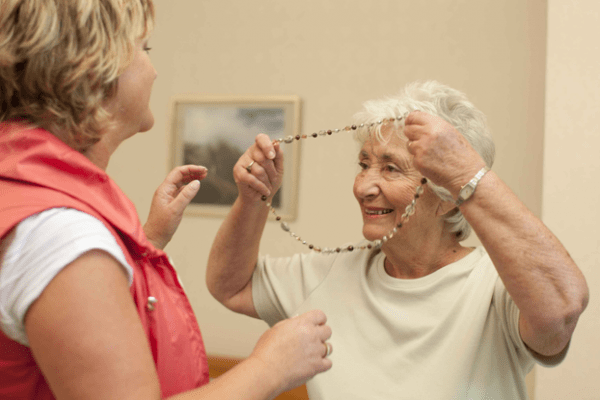 Some groups focus on caring for those with particular illnesses or conditions such as dementia. 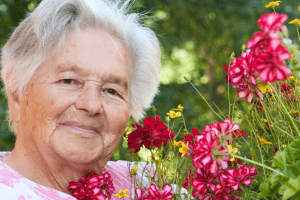 Use Respite (Temporary) Care Coping strategies are essential for all family caregivers but sometimes these are simply not enough and what you really need is a complete break from the situation you find yourself in. This might be simply having an overnight carer come to the home so you can catch up on lost sleep or a longer arrangement so you can have time away. This is when respite care can help. A Carer's Assessment is available from the NHS to determine whether you might be eligible for some financial help towards this, but whether you are or aren't eligible for financial support it is something of enormous benefit to all family carers. Seek Professional Advice Caring for a beloved family member is challenging and stressful but it doesn't have to be borne alone. Whereas respite care will provide temporary assistance looking after your loved one it is also possible to arrange home care where a professional carer comes to your home on a regular basis that can be agreed beforehand to simply ease the burden of caring. A tailored plan can be put in place that suits your needs and financial situation and provides only the type of care which you need help with. For instance, a carer could come every morning and evening to help the person being cared for get out of bed, get washed and dressed. And again help them back to bed in the evening. Or maybe you just need help to allow you to attend a regular weekly social event, or someone to be there during the night so you can sleep. It is completely normal to find the role of care-giver to a sick relative highly challenging and for it to take its toll emotionally and physically. So it is important that you give yourself the opportunity to deal with those emotions and to get the help you need rather than bottling up your feelings and trying to cope alone. It may simply be that all you need every now and then is lunch with a friend and the opportunity for a chat that isn’t about your own personal situation or that of the person you care for. It may be that some exercise, a walk in the country or maybe even a week-end away could be what you need. When you do take some time for yourself avoid at all costs feeling guilty that you have handed over care, albeit temporarily, to someone else – simply try and enjoy your time away. Sometimes just having the chance to let off steam can help. Help is available to ensure a better future for you, and the person you care for. Another great article. I certainly went through a whole host of emotions whilst caring for my father and it is comforting to know that I was not alone and that many other people in a similar situation with their loved ones experienced the same thing. This information is spot on. And having a live-in carer come in for 2 weeks was a godsend. I was able to have a relaxing holiday and recharge my batteries! So glad you were able to recharge your batteries Julie – sometimes the respite that a professional live-in carer can provide is really all a family carer needs from time to time.